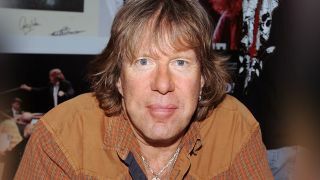 Greg Lake says the tragic death of Emerson, Lake And Palmer bandmate Keith Emerson was no shock to him. Frontman Lake reports that Emerson had been struggling with depression since at least 1977, and believes the illness claimed his life. He adds: “It’s very difficult to describe what depression is. We all know what it looks like. People’s moods become very black. But it’s more complicated. It changes someone’s personality. Emerson’s girlfriend has reported that the musician was “tormented with worry” over a degenerative disease that made it difficult for him to play, and she’s suggested that was the main reason behind his final act. He urges: “If anyone does have feelings of being so desperate that they think it’s better off not to wake up tomorrow, please talk to somebody. The doctor, your friend, anybody. Help and advice is available worldwide for people struggling with suicidal thoughts. Meanwhile, ELP drummer Carl Palmer has vowed to keep Emerson’s music alive. He says via Facebook: “I will deeply miss Keith. We have lost a very talented and gifted musician, but this great music will continue for a long, long time. Rick Wakeman has paid his own tribute to Emerson, saying: “Keith and I always got on great and had tried on numerous occasions to produce an album together, but it never happened because of third parties interfering, which upset us both.